At the far end of Newham, where a gasworks used to sprawl, is the tallest artificial hill in London. It started out as a slag heap, piled high with debris from Beckton Gas Works, once the largest in Europe. Opened in 1870, it took in coal by river and converted it to gas pumped right across the northern half of the capital. But natural gas from the North Sea hastened its end, which came after 100 years of operation, and the entire site was abandoned. Various film crews took advantage, most notably Stanley Kubrick who destroyed most of the buildings to create the last hour of Full Metal Jacket. Most of the site is now business park, retail park or "still too poisonous to do anything with", while the waste tip was landscaped with the addition of rubble from the basement of the British Library. 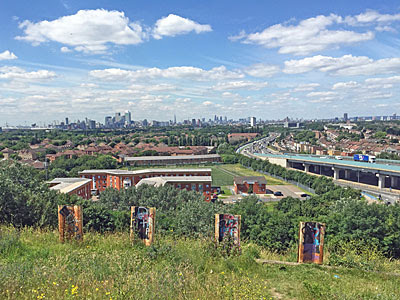 A dry ski slope opened here in 1988, as part of the creation of Beckton's new residential neighbourhood, and downhill blading continued until 2001. A bold attempt by Norwegian investors to create a Snowdome on the site then fell through, and for the last decade and a half the so-called Beckton Alps have reverted to nature. Despite being long closed, a certain amount of infrastructure remains. A zig-zag footpath, unsigned and unkempt, rises up from Woolwich Manor Way via slightly more hairpin bends than you'd expect. Either keep to the tarmac, brushing overhanging stems out of the way where necessary, or take a steep but well-trodden shortcut up the centre. Yes, of course the summit's been fenced off for health and safety reasons, with additional yellow signs warning Danger Hazardous Site KEEP OUT, and additional notice that Trespassers Will Be Prosecuted. But head to the locked gate at the very top of the path and you'll see this hasn't been enough to deter determined locals, because a couple of metal uprights have been removed to leave a gap easily wide enough to squeeze through. Obviously you won't be doing this. Not just one artificial hill but four, sculpted out of building spoil on former wasteland beside the A40 in Greenford. 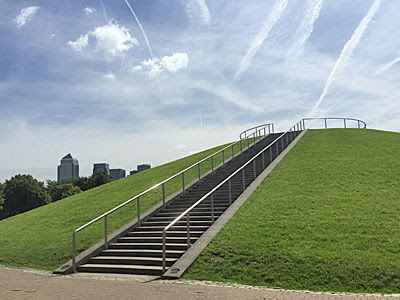 Using rubble from the demolition of Wembley Stadium and the creation of Westfield at White City, a quartet of grassy mounds was created, their cumulative height the same as that of Wembley's twin towers. Not only do they help block out traffic noise but they're undeniably striking, each a squat symmetrical hillock with steep grass sides, and begging for interaction. The three smaller peaks aren't officially for climbing, but several radial grooves reveal desire lines created by those intent on reaching the top. But the biggest hill has an observation corral at the summit, accessed via a lazy spiral path that takes ages to ascend, edged by gabions of concrete debris and the occasional bench (used by shortcutters as a step). The transformation of Rotherhithe from docks to real estate led to the throwing up of this little beauty. Most of the centre of the Surrey Docks was filled in during the 1980s, the resulting landscape recognised by the developers as a bit dull so they dug a new waterway - the Albion Channel - and used the excavated earth to create Stave Hill. This truncated cone is scaled via a single staircase of 59 steps, and stands on top of what was once Russia Dock, as a beautiful 3D map of the former landscape at the summit confirms. It was added to give residents a view over their immediate neighbourhood, something otherwise tricky in an area colonised by proper houses rather than endless flats. And it's a view that has changed dramatically over the last thirty years. 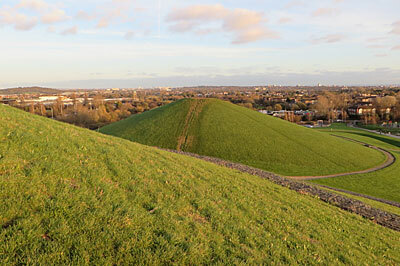 » Monolith Hill (29m): Artificial summit in a former gravel pit in Hounslow, now Bedfont Lakes Country Park, landscaped with 2 million tonnes of soil and topped off by a big lump of stone and a metal disc for identifying the encircling landmarks. » Belmont: Originally Bell Mount, this manmade mound was created for the Duke of Chandos's landscaped estate in the early 18th century, and had a summerhouse on top. Now part of Stanmore Golf Club, and crossed by a single public footpath. » Mill Hill: Not that one in Barnet, but the largest of the landscaped rubbish tips at the eastern end of Mitcham Common. 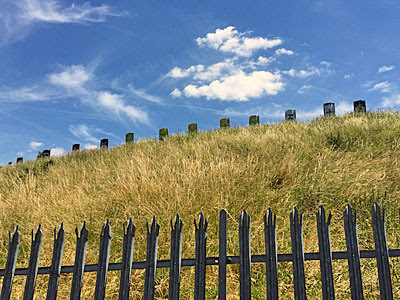 » QEOP's teardrop mound: This highpoint near the Velodrome supports the Olympic Rings, and numerous selfie-takers (although the mound alongside is fractionally higher).